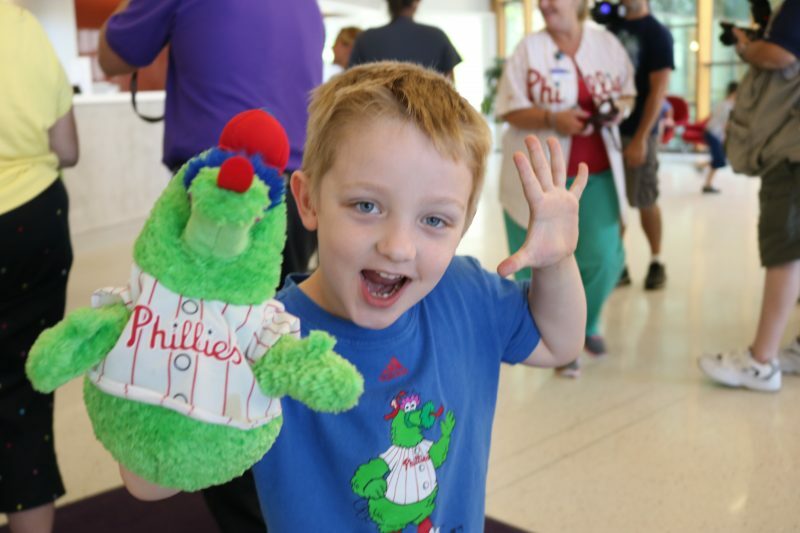 The Phillie Phanatic hammed it up for a photo with Quinn Bisbing, 5, of Atco, during a visit by the Phillies mascot to Shore Medical Center Friday. Quinn Bisbing, 5, was all ready for a visit from the Philly Phanatic, the official mascot for the Philadelphia Phillies, known for being very large, green and energetic, to say the least. Quinn waited with family at a place you wouldn’t normally see the flightless “bird.” About noon on Friday, the Phanatic made his appearance at Shore Medical Center in Somers Point. He greeted patients for about a half an hour. He had pictures taken with patients, including three new babies on the maternity floor, officials said. The Phillie Phanatic gives the crowd high fives. 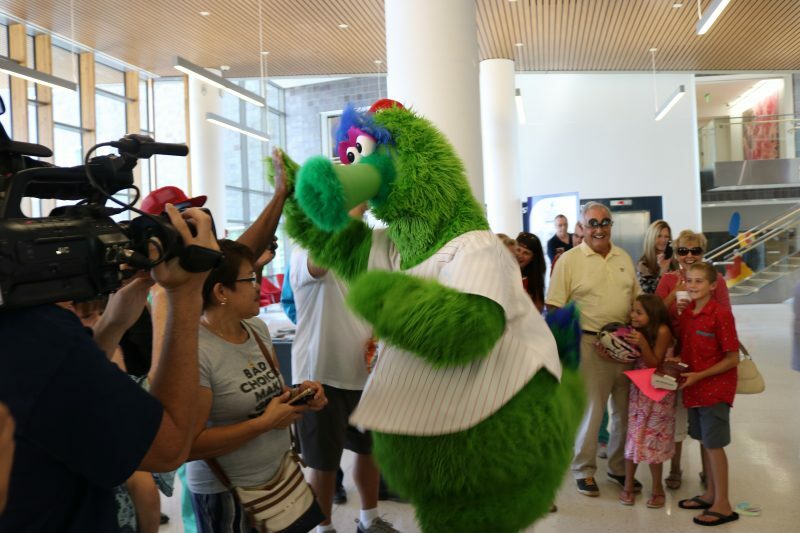 Then the Phanatic hustled to the lobby, where Quinn and a group of fans, from hospital employees to families, awaited his arrival. And it wasn’t a subtle entrance. 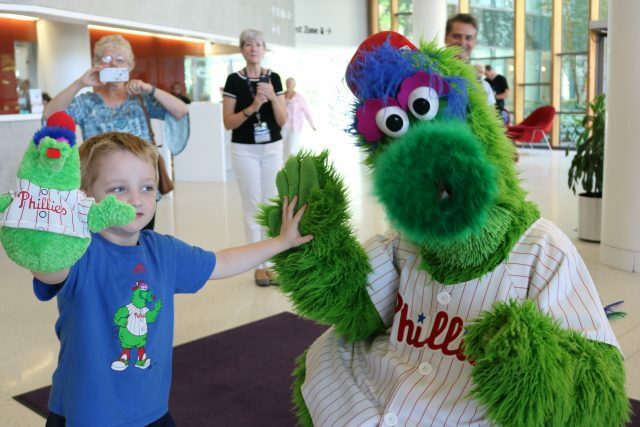 The Phanatic, known for entertaining crowds at Phillies games, was the maestro as the audience sang “Take Me Out to the Ball Game,” did a dance, posed for photos and threw out some high fives. Quinn brought a little something to show his admiration for the zany mascot. He clutched a Phanatic stuffed animal. Quinn Bisbing, of Atco, is a huge Phillies fan. “I really like the Phanatic,” said the Atco resident, whose mom Beth Ann Spiegel works as marketing coordinator for Shore Medical Center. Quinn’s sister Sasha, 2, also came along for the event. As the Phillies fight for a playoff spot, the Phanatic’s appearance seemed to pumped up the crowd. This was the first appearance by the famous beloved mascot at the hospital, officials said. The Phillie Phanatic gets fans pumped up. Jennifer Pero, nurse manager of surgical services, came up with the idea to not only brighten the day of patients, but also give a small reminder to employees that they are appreciated. “I really like to do things for my staff, so they know they are so appreciated. They take care of the patients and work so hard,” Pero said. 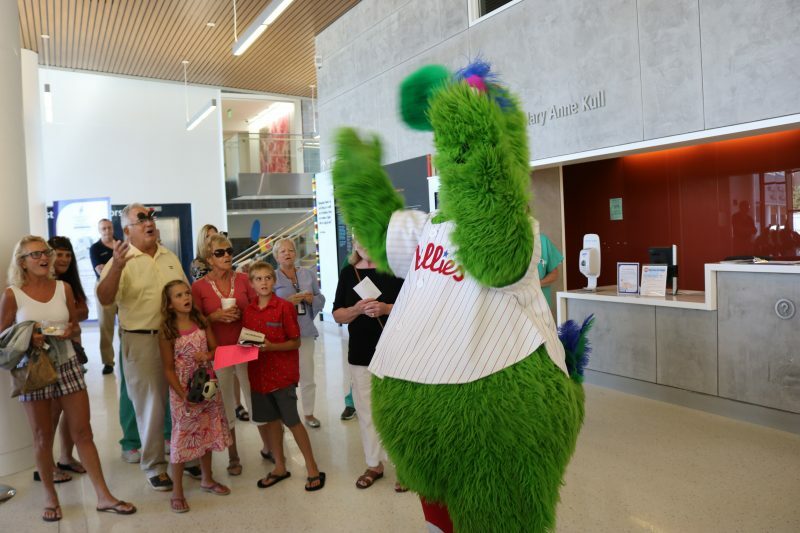 So, she decided to invite the Phanatic to join Shore Medical Center for an afternoon. The Phillie Phanatic and a fan pose for a selfie.